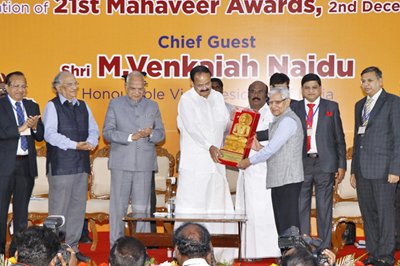 21st Mahaveer Award for excellence in human endeavour in the field of Non-violence & Vegetarianism, Smt. 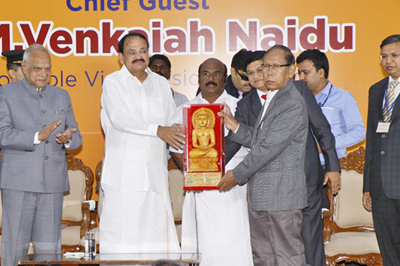 Shiranee Pereira, Chennai, Tamil Nadu, for excellence in human endeavour in the field of Medicine, Bhagwan Mahavir Jain Relief Foundation Trust, Hyderabad, Telangana, for excellence in human endeavour in the field of Community & Social Service, Rural Health Organisation, Imphal, Manipur presented by Shri M.Venkaiah Naidu, Honourable Vice President of India. The People for Animals (Chennai) was established in 1995 to champion the cause of voiceless animals. Dr. Shiranee Pereira is one of the founders of People for Animals, Chennai. Working with compassion and dedication, PFA has revolutionized the concept of animal welfare with its proactive approach. From powerful presentations on international platforms to midnight rescues on highways and surviving attempts on their lives, the PFA has consciously worked to promote the concept of “Ahimsa” and non-violence in every arena of animal use and abuse. The PFA, Chennai looks after over 1500 animals on a daily basis, providing them food and veterinary care. Dr. Shiranee Pereira initiated Animal Birth Control and immunisation program in 1995 for the street dogs which put an end to the 60 year old practice of brutal electrocution of street dogs in the city. 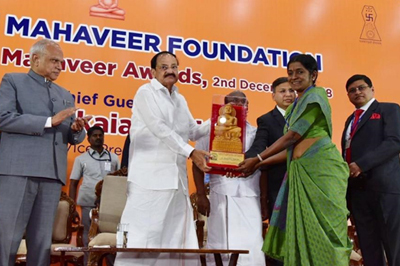 She pioneered the rehabilitation of sick and abandoned animals. She has rescued and rehabilitated thousands of laboratory animals since 2000. She prepared the India National guidelines for the ethical use of equines in anti-snake venom serum production in 2002. In 2007, she co-founded I-CARE, creating a mass movement among the teachers and students to stop the use of animals in dissection. Dr. Shiranee rescued about 100 wild animals in dangerous and life threatening situations and prevented cruelty to animals. Since the last 15 years she has been personally looking after the PFA Jinendra Animal Hospital & shelter, at Red Hills, Chennai. She is totally committed to the prevention of abuse and cruelty to animals and their general welfare. 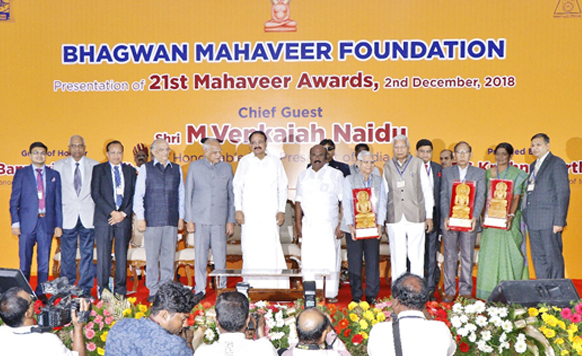 The Bhagwan Mahavir Jain Relief Foundation Trust was founded by sixteen like minded Jain friends in 2009 in Hyderabad to improve the quality of life of people who require dialysis and cannot afford the medical expenses incurred. Dialysis is an expensive process and the monthly expenses of dialysis alone run into several thousands of rupees. Added to this, most dialysis patients have a few other complications such as anaemia and cardiovascular problems. Due to this, they need a host of other medications. The Foundation provides much needed service of dialysis to patients at no cost to patients. Patients seeking special wards are charged Rs.200. Majority of patients are indigent. The service is provided to all deserving patients irrespective of caste, creed and religion. The Foundation operates 124 dialysis machines in 4 places. On the last Sunday of every month, coupons are distributed to the patients entitling a person to a single session of dialysis at a particular hospital. The patient can avail any number of coupons. The Trust has supplied injections that cost more than Rs. 1,000 in the market at Rs. 380 only. In the last nine years, they have supported more than six thousand patients with dialysis or medicinal support and have not denied any patient for support. They are also a model for partnership between Government and not-for-profit organisation. Rural Health Organisation (RHO), Imphal, Manipur was established in 1986 with the funds from Ministry of Social Justice and Empowerment, Central Social Welfare Board, National Children’s Fund and organisation’s own source. It has been extending various services like Integrated Rehabilitation Centre for Addicts (30 bedded centre), Short Stay Home for Women and Girls (30 women & 7 children), Education & Health Care for 30 Girl Children and Sensitization Programmes for Mothers, Rural Homeo Dispensary, Primary Health Care Centre, Mobile Health Service, Pre-School for Disabilities and Day Care Centre for Aged etc. Its welfare services especially in the remote hilly areas of Manipur has largely benefitted the tribal poor, SC & ST populations. This NGO’s services for women and child welfare are noteworthy. Its short stay home has sheltered and rehabilitated over 800 disadvantaged women and 200 children. It has educated 30 ST & OBC girl children, secured self-employment to 150 deserving ST/ SC women through vocational training programmes and rehabilitated more than 90 child labourers. The awareness programmes of the NGO focus on substance abuse and HIV/AIDS. It has counselled 3800 addicts, treated over 2300 addicts and created awareness among 10200 highly vulnerable groups. The other programmes conducted are national integration camp, pre-school for disabled, day care centre for the aged, national environment awareness campaigns, Bio-medical waste management, rural homeopathy dispensary and mobile health services. A large number of people have been benefitted by the services of this organisation.